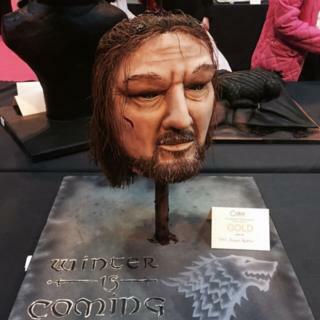 Image caption The character Ned Stark's head was stuck on a spike in the series providing the inspiration for Dawn Butler's cake which includes chocolate "blood"
A larger-than-life cake depicting Game of Thrones character Ned Stark's head on a spike has won an international award for sculpture baking. Dawn Butler, from Nottinghamshire, spent three weeks fashioning the gruesome gâteau for the International Craft and Hobby Fair. The head is made from six layers of cake coated in ganache and chocolate paste with individual noodles for hair. Ms Butler said: "Be warned - it's a head on a stick." It was the first time that internal cake supports have been allowed in the competition category, prompting the West Bridgford baker to put the character, played by actor Sean Bean's head on a spike. She won gold in the carved cake category at the competition in Birmingham for her "Winter is Coming" creation. "I wanted the hair to look like it's growing. It's actually vermicelli - a rice noodle which I steamed so it bends the way I want it to. Then I airbrushed it to make it look like hair," she said. "The cake is about five or six layers with the features modelled with chocolate and then covered in chocolate paste as well." Despite the cake being made from entirely edible ingredients, Ms Butler would not recommend tucking in. "I don't think I could bring myself to eat it, not because of the hard work that I've put into it. I do like people to eat my cakes - it's just the vermicelli has now gone hard again and I imagine that it's quite crunchy."